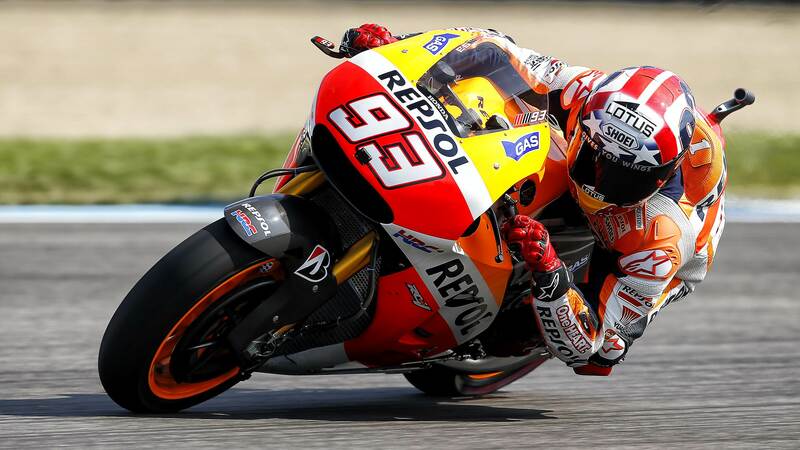 Marc Marquez continued his dominating qualifying form today at Indianapolis Motor Speedway, the Repsol Honda rider setting a lap time of 1’31.619 to take his eighth pole position from ten rounds this season. Having already shown impressive pace during long runs in the practice sessions, Marquez also showed his peerless pace over a single lap, ending the Qualifying Practice 2 session 0.225 seconds ahead of Ducati Team’s Andrea Dovizioso who rode brilliantly to secure second place on the grid for the race. Third quickest in qualifying was Movistar Yamaha MotoGP’s Jorge Lorenzo who managed a best lap time of 1’31.869 to finish a quarter of a second behind Marquez. Both Marquez and Lorenzo used the combination of the medium compound front and rear slicks to set their quickest time, while Dovizioso used the soft compound rear slick paired with the medium compound front to set his personal best lap time. Conditions were dry for all of today’s sessions with a peak track temperature of 40°C recorded at the start of Free Practice 4. The fine weather allowed riders to compare different tyre combinations during their race simulations, and the harder rear slick options; hard compound for the Factory Honda and Yamaha and medium compound for the Ducati and open-class riders were preferred by almost every rider. Rider feedback for the medium compound front slick, which was brought to Indianapolis for the first time this year has been overwhelmingly positive and this option will be the most widely used choice for the race. The current weather forecast indicates a fair chance of rain tomorrow afternoon with similar ambient temperatures to today. “I am happy to have taken this pole position, because it is important to start well after the summer break. The fundamental thing is that we have a good pace for tomorrow. The tyre choice tomorrow will also be important, especially with the rear. We will see what the temperature is like and, from there, decide which compound to use. I am happy with how I am feeling, and we will try to give 100%, as always”. “In qualifying I wasn’t able to improve my best time with my second tyre, because I couldn’t do it on the three attempts I had at a hot lap. When you don’t improve on this second run, you are always going to have people move ahead of you on the grid. The times are very close and unfortunately for us we had a bad qualifying session. In any case, I will work with the team tonight and tomorrow morning to try to find a faster pace for the race, and look for a little more rear grip”. “Luckily I’m feeling okay now, but this morning’s crash was really scary; I had a high side and I think I have been flying for several seconds… Hovewer, like I said I’m physically fit, I’m just disappointed because the feeling with the bike is not the best; we have been struggling a lot with rear grip and this is the cause of the crash I had in FP3. In this condition I cannot ride, because if I try to go a little bit faster I risk to crash, like it happened this morning. This is frustrating. For sure tomorrow we will face a tough race, but we will try our best, as always”. “I’ve been feeling really good since the beginning of the weekend, and today it was really nice to get to the Qualifying 2 session for the first time this year. I’m happy also because in Q2 I improved my lap time again. Today I was able to push hard all the time, so I’m looking forward to tomorrow’s race; we’re just struggling a little bit with front grip: after 5 or 6 laps, even if you can’t see tyre wear, you feel less grip and less confidence, so we will work tonight to find something to fix it. For the race we will use the medium rear tyre, because after 1 or 2 laps the softer one drops a lot; however, even with the medium compound my lap times are good and I don’t feel a big difference, so I’m confident. We will see how it goes tomorrow”.